The Los Angeles Basin is located in southern California, in a region known as the Peninsular Ranges. The basin is also connected to an anomalous group of east-west trending chain of basin collectively known as the California Transverse Ranges. The present basin is a coastal lowland area, whose floor is marked by elongate low ridges and groups of hills that is located on the edge of the Pacific plate. 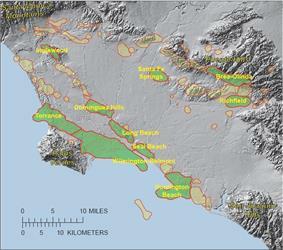 Along with the Los Angeles Basin, the Santa Barbara Channel, the Ventura Basin, the San Fernando Valley, and the San Gabriel Basin lie within the greater southern California region. On the north, northeast, and east, the lowland basin is bound by the Santa Monica Mountains mountains and Puente, Elysian, Repetto hills. To the southeast, the basin is bordered by the Santa Ana mountains and the San Joaquin Hills. The western boundary of the basin is marked by the Continental Borderland and is part of the onshore portion. The California borderland is characterized by north-west trending offshore ridges and basins. The Los Angeles Basin is notable for its great structural relief and complexity in relation to its geologic youth and small size for its prolific oil production. Yerkes et al. identify 5 major stages of the basin's evolution that begins in the Upper Cretaceous and ends in the Pleistocene. This basin can be classified as an irregular pull-apart basin accompanied by rotational tectonics during the post-early Miocene. During pre-Turonian, metamorphosed sedimentary and volcanic rocks are present that serve as the two major basement rock units for the LA Basin. Large-scale movement along the Newport-Inglewood zone juxtaposed the two bedrock units along the east and west margins. During this phase, the basin was above sea level. After the deposition of the deposition of the pre-Turonian units, there was a large emergence and erosion that can be observed as a major unconformity at the base of the middle Miocene units. Emergence did not occur at the same rate or in all sections of the basin. During this time, the basin was covered by a marine embayment. Rivers sourced in the highlands brought large amounts of detritus to the northeastern edge of the basin. During this period, the Topanga formation was also being deposited. The present form and structural relief of the basin was largely established during this phase of accelerated subsidence and deposition which occurred during the late Miocene and continued through the early Pleistocene. Clastic sedimentary rocks from the highland areas (to the north and east) moved down the submarine slopes and infilled the basin floor. Subsidence and sedimentation most likely began in the southern portion basin. Subsidence and Deposition occurred simultaneously, without interruption, until the late Pliocene. Until the rate of deposition gradually overtook the rate of subsidence, and the sea level began to fall. Towards the end of this phase, the margins of the basin began to rise above sea level. During the early Pleistocene, deposition began to outpace subsidence in the depressed parts of the basin and the shoreline began to move southward. This phase also had movement along the Newport-Inglewood fault zone that resulted in the initiation of the modern basin. This movement caused the southwestern block to be uplifted relative to the central basin block. Homogeneous evolution of this basin did not occur due to dynamic tectonic activity. Despite the active setting, there ar over 9,100 m of strata within the basin. The dynamic setting was also responsible for the heterogeneous deposition of each formation. It is common for rock units of the same depositional event to have different names in different locations within the basin. This may be a result of large variation in clast size as with the upper Pliocene Pico Formation in the northwestern part of the basin and the Upper Fernando Formation in the southwest part of the basin. The Los Angeles Basin contains what is known as the "Great Unconformity" which has been interpreted as a large scale erosional event in the basement rock unit. This unconformity is used to correlate strata throughout the basin. The record of the Cenozoic activity begins above this unconformity. The stratigraphic record for this basin indicates that it began as a non-marine environment and then transgressed to a deep ocean system. The oldest basement units of this basin are of both sedimentary and igneous origin. The sedimentary unit was metamorphosed as a result of slippage of the Newport-Inglewood fault and is known as the Catalina Schist. The Catalina Schist can be found on the southwestern edge of the basin and is predominantly a chlorite-quartz schist. Closer to the Newport-Inglewood fault zone, garnet-bearing schists and metagabbros occur. The Santa Monica Slate can be observed in the northwestern block of the basin. The eastern complex is characterized by Santiago Peak Volcanics. This rock unit contains andesitic breccias, flow, agglomerates and tuffs. The Fernando Formation is split into two sub-facies known as the Pico and Repetto Members. These members represent a distinct change in the depositional environment and are of Pleistocene age. The Repetto is the older of the two members and is composed of interbedded fine to coarse grained siltstone, mudstone,and sandstone. The Pico Member is mostly made of massive siltstones and sandstones interbedded with minor silty-sandstones. Holocene Alluvium and Quaternary sediments is a largely unconsolidated unit and is composed mostly of gravel and floodplain sediments. The sediments that mark the top of the basin can be found in modern streams/rivers and at the base of the foothills. Because the basin lies on the boundary of the Transverse and Peninsular Ranges, this basin experiences both compressional and strike slip tectonics. During the early Pliocene, also identified as the "Basin Disruption" phase, deformation and folding occurred as a result of fault movement and a slight rotation event. While movement along the San Andreas Fault is responsible for the placement of the basin, it is the Whittier and Newport-Inglewood faults that have dictated the seismic behavior within the basin. The Los Angeles basin is still active tectonically and the region continues to experience earthquakes as a result. Due to the number of faults and fault splays, seismic activity is not concentrated in one particular area. The cities that are overlain by the Newport-Inglewood and Whittier fault zones have a higher probability of experiencing seismic activity. The region experiences earthquakes that are mostly mild (magnitude ≤2.25). However moderate earthquakes (magnitude 4.9 to 6.4) have been reported. Earthquakes of moderate magnitude are very infrequent. This fault lies on the eastern border of the basin and mergers with the Elsinore Fault in the canyon of the Santa Ana river. This fault is a reverse right-oblique fault. It is most known for the Whittier, Brea-Olinda, Sansinena, oil fields. There is an anticline that runs parallel to the Whittier fault that is evidence for compressional deformation during the late Miocene to early Pliocene. Thinning and pinch-out of the Pliocene sandstones are evidence for uplift during this same time period. The Anaheim nose is a subsurface feature that was discovered by geophysical surveys and exploratory drilling in 1930. It is a mid-Miocene fault block that revealed a northwest trending ridge of Paleocene age rocks. This structural feature is important because it revealed oil traps and orientation of the beds indicate the age of subsidence in this portion of the basin. Accumulations of oil and gas occur almost wholly within strata of the younger sequence and in areas that are within or adjacent to the coastal belt. The Puente formation has proved to be the most notable reservoir for petroleum in the basin. The primary reason for the high abundance of oil is because the oil sands are well saturated within the basin. The thickness of these oil sands range from hundreds to thousands of feet. Anticlines and faulted anticlines are the structural features that are also responsible for trapping oil. The first reported oil-producing well was discovered in 1892 on the land that is presently beneath Dodgers Stadium. This basin was responsible for half of the states oil production until the (90's?). This is remarkable due to the relatively small size and youth of the basin. The basin currently has about 40 active oil fields that collectively have 4,000 operating wells. 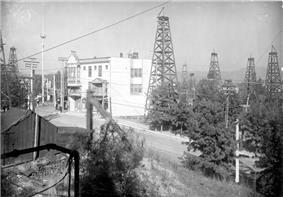 In 1904, there were over 1,150 wells in the city of Los Angeles alone. Tight spacing and continued pumping of the wells resulted in most of the wells to dry up. Most recent data indicates that 255 million barrels of oil were produced in 2013. This is a large decline from the almost 1 billion barrels per year produced in the late 1970s. ^ a b c d e f Jahns, Richard (1973). "A Profile of Southern California Geology and Seismicity of the Los Angeles Basin". AAPG: 1–20. ^ Yeats, Robert (2004). "Tectonics of the San Gabriel Basin and surroundings, southern California". Geological Society of America 116: 1158–1182. ^ a b c d e f g h i j k l m n o p Yerkes, R.; McCulloch, T.; Schoellhamer, J.; Vedder, J. (1965). "Geology of the Los Angeles Basin, California- An Introduction". Geological Professional Survey Paper: A1-A55. ^ a b c d Bilodeau, William; Bilodeau, Sally; Gath, Eldon; Oborne, Mark; Proctor, Richard (May 2007). "Geology of Los Angeles, United States of America". Environmental & Engineering Geoscience XIII (2): 99–160. ^ a b Biddle, Kevin (30 May 1990). "The Los Angeles Basin: An Overview". American Association of Petroleum Geologists, A Memoir 52: 5–24. ^ Crouch, James; Suppe, Jonh (November 1993). "Late Cenozoic Tectonic Evolution of the Los Angeles Basin and Inner California Borderland: A Model for Core Complex-Like Crustal Extension". Geological Society of America Bulletin 105 (11): 1415–1435. ^ a b c d Hauksson, Egill (10 September 1990). "Earthquakes, Faulting, and Stress in the Los Angeles Basin". Journal of Geophysical Research 95 (B10): 15,365-15,394. ^ a b Schnider, Craig; Hummon, Cheryl; Yeats, Robert; Huftile, Gary (April 1996). "Structural Evolution of the Northern Los Angeles Basin, California, Based on Growth Strata". Tectonics 15 (2): 341–355. ^ Nicholson, Craig; Sorlien, Christopher; Atwater, Tanya; Crowell, John; Luydendyk (June 1994). "Microplate Capture, Rotation of the Western Transverse Ranges, and Initiation of the San Andreas Transform as a Low-Angle Fault System" (PDF) v.22. pp. 491–495. Retrieved 18 February 2015. ^ Hill, Mason (October 1971). "Newport Inglewood Subduction and Mesozoic Subduction, California". Geological Society of America Bulletin 82: 2957–2962. ^ Arnold, Ralph; Loel, Wayne (July–August 1922). "New Oil Fields in the Los Angeles Basin". Bulletin of the American Association of Petroleum Geologists 6 (4): 303–316.